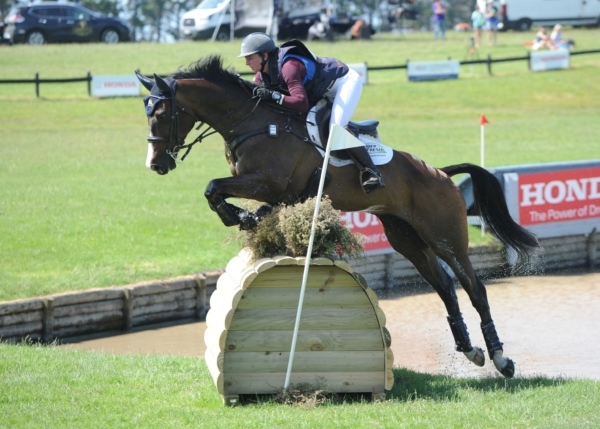 Consistency is the name of the game in any series, and consistency sees Samantha Felton top the standings in the ESNZ Eventing Super League following the Puhinui International Three-day Event, which marks the end of the spring eventing season and the halfway stage in the series. Felton won the Honda NZ CCI3* at Puhinui on Ricker Ridge Divine Right, taking the lead after Saturday’s cross-country when her thoroughbred mare, by His Royal Highness, was the only horse to finish inside the time on the punishing going resulting from so much rain prior to the event. But it was her third placed ride Ricker Ridge Rui who rocketed into the lead in the Super League, having placed consistently all season. However these could be the last points Felton will earn in the series, as she is planning to take a team of “about four” horses to England to gain experience on the European circuit. She said, “It is a bit of a pipe dream, as I’m still trying to gather support to get there,” but on past form she is sure to make it, as she has overcome major obstacles before (like a broken pelvis) with her determination and drive. She is getting married on 12th January so 2019 will be a big year. Having already represented New Zealand in the successful Oceania team at the Melbourne Three-day Event at Werribee last year, this is the next step in Felton’s career, with 4* events in the northern hemisphere to look forward to. She is a great example of the training programme put in place to help riders move from national to international competition, and will join the bunch of Kiwis already based in Britain. Madison Crowe and Waitangi Pinterest, who lead after the dressage at Puhinui, dropped to second after incurring time faults on the cross-country, but held that place despite two rails down in the showjumping. This has moved them into contention in the Super League, with all to play for in the autumn. Samantha Felton (Matangi), Ricker Ridge Rui, 83 pts; Amanda Pottinger (Havelock Nth), Just Kidding, 54 pts; Samantha Felton, Ricker Ridge Divine Right, 51 pts; Donna Edwards-Smith (Te Kauwhata), DSE Cluny, 51 pts; Madison Crowe (Matangi), Waitangi Pinterest, 48 pts.